Soooo....I have been creating.....yep that's right creating!!!! Lots of it too. I guess that's what Convention does to you- gets those creative sparks firing and makes you want to create just for the love and joy of it. I have wanted this stamp set 'Awash with Flowers'for such a long time and it is finally mine. I really LOVE it and I am having such fun playing with it. I hope you can see how sparkly the big tulip is. I used a 50/50 mix of clear embossing powder and Dazzling Diamonds to make it shiny and sparkly all at once. My bow is of course a Teneale Williams bow- these little babies are going to be popping up all over the place after her amazing Workshop WOW at Convention. It looks a lot fuller in real life. You won't quite believe it but I have another card to show you in my next post. I'm on fire- hahahaha. Such a pretty card Louise. Love your ribbon/button detail. I too want this set - one of these days it will be mine! You certainly are on fire. 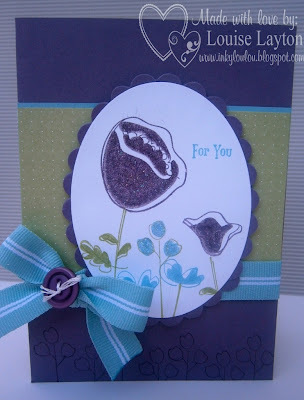 Love your Teneale inspired bow and your card is 'awash with gorgeousness'. It was lovely to meet you at Convention and I loved your cute little 3D swap.